A prominent Bahraini human rights activist has appeared in court charged with inciting protests by using social networking sites. Nabeel Rajab was arrested on 5 May at Manama's airport, on his return from the Lebanese capital, Beirut. Mr Rajab is a fierce critic of the Bahraini authorities and very active on social network websites as well as in anti-government protests. He described his trial as "vindictive" and political, AFP news agency reports. Mr Rajab is often seen in the forefront of opposition demonstrations in Bahrain and is a vocal critic of the ruler, King Hamad al-Khalifa. Witnesses at the trial have said there were more than 50 lawyers defending Mr Rajab. AFP reported that Mr Rajab addressed the court saying: "I only practiced my right to free expression. I did not commit a crime. The decision to arrest me and put me on trial was a political decision". The trial spurred much activity on the micro-blogging site Twitter, where Mr Rajab has more than 140,000 followers. Unidentified followers posted to his account, saying: "Nabeel Rajab is still detained. We activated his account as per his request". 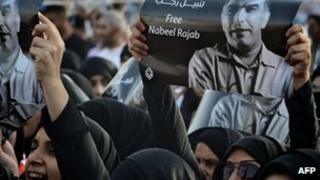 On Tuesday, Human Rights Watch urged Bahraini authorities to drop the case against Mr Rajab. "The charges against Nabeel Rajab are nothing more than attempts to silence one of the Bahraini government's most prominent critics," said Joe Stork, deputy Middle East director at the New York-based watchdog. Mr Rajab is accused of "inciting illegal rallies and marches online by using social networking websites". A statement from the Bahraini Interior Ministry said: "A police investigation also revealed that the defendant's cyber incitement proved detrimental to public security as it fuelled rioting, road-blocking, arson, acts of sabotage targeting public and private properties, and the use of petrol bombs and incendiary devices." The ministry said Mr Rajab had admitted posting "defamatory and humiliating" depictions of state security forces, "but was non-compliant during further detailed questioning" and refused to recognise the court.